About a month ago, I was in Baltimore and had a fascinating conversation with Gaia. We were debating which form or forms of government can best be used as an analogy to structure of the street art and graffiti worlds. The primary systems of government that we mentioned were democracy, autocracy/dictatorship, and anarchy. Gaia’s post on the conversation went online a while ago and can be read on his blog. As Gaia notes, he believes that both street art and graffiti are inherently democratic. Artists and writers can put up their message and everybody has just as much right as anybody else to do so. I would add that this democracy also creates a general respect and understanding between those working on the street. For example, Barry McGee’s work is not going to be painted over because, as a group, artists and writers have given him a lot of respect. Similarly, it is generally understood within graffiti that there is a hierarchy of work, and that work of a higher complexity (pieces) can go over simpler work (tags, throw-ups…), and that hierarchy is upheld by consensus among writers. Gaia’s view seems to be the prevailing opinion among street artists, and many specifically talk about how the democracy of the street is what draws them to working in such a unique environment. I held this view for a while as well. Then Brad Downey told me that he believes street art is the opposite of democracy. Essentially, his argument is that street art allows him or anybody else to do whatever they want, which isn’t democracy at all. And I’ve started to think he has a point. Maybe street art is more like anarchy. In a democracy, everybody can voice their opinions, but their actions must ultimately be judged as acceptable or not by the masses. That means an artist could be reprimanded for his or her actions if they are against the general will of the other artists. While there are some unwritten rules of street art and artists might be frowned upon for breaking them, that’s about all the punishment they will get. As long as an artist is not afraid of people hating him, he could potentially claim that ripping up every Swoon wheatpaste in New York is his form of street art, and nobody could stop him no matter how upset they might be. On the street, artists can do pretty much anything they want. Somebody’s going to point out that Gaia uses a different definition of democracy than I do. Well, we can still look at his definition (“a realm in which agonistic polemics and discourses can occur without suppression”) and see why it doesn’t fit with street art. Take a look at that last bit where it notes “without suppression.” Work gets painted over all the time, and that certainly seems to me like a form of suppression. While all fans of graffiti and street art must accept the ephemeral nature of the work, that generally implies that the work decays over time. On the contrary, work can be buffed or removed seconds after it is put up, and even within the community, many artists have no qualms about painting over other people’s work (and some even develop personal vendettas which play out as writing over/supressing brand new work – see 10 Foot). If that’s not suppression (particularly when it is done by fellow artists/writers), I don’t know what is. Another potential system of government comparable to the street art and graffiti world might be a dictatorship. Particularly in the graffiti world, artists can get extremely hierarchical (can you believe I spelled that right on the first try? ), and the kings have a good deal of power. Admittedly, I am not anywhere near as knowledgeable about graffiti as I am about street art, but as I understand it, not only is there the hierarchy I mentioned earlier with different types of pieces taking precedence over others, but the work of certain writers is left alone by all but the most bold up and coming writers. And unlike street art, when writers do break the rules, they get into actual fights about it (and no, street art’s flickr comment wars do not count). This even crosses into street art a bit. The way that the street art community currently works, its existence is entirely dependent on passive acceptance by the graffiti community. All too often, street artists get their work intentionally written over with tags and graffiti, and the artists act as though they are honored that some writer is familiar enough with their work to write over it. If graffiti writers wanted to really put in the effort, they could virtually destroy a city’s street art scene. 10 Foot has shown this very well. Even though most artists are still trying to get up, it’s extremely rare to see certain artists whose work has not been tagged over by 10 Foot. That’s not a dialog, it’s suppression. 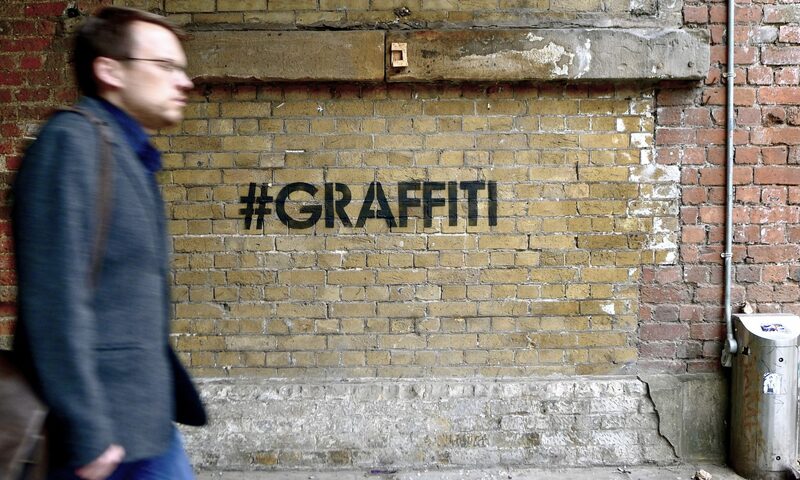 The reality is though, no one of these systems can fully encapsulate what street art and graffiti are. I think it is more accurate to say that the correct analogy is whichever one the last person to get up was thinking of when they did their work. Some artists do work with the intent of creating a democratic dialog and respecting the work of others. Other artists just get up for themselves or to spread their message, disregarding the will of others. And many just paint to maintain a balance of power.